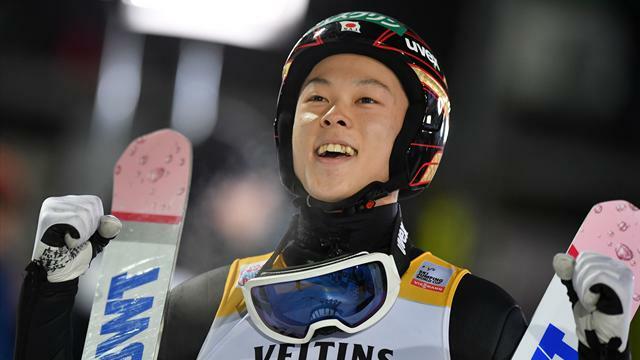 Japanse ski jumper Ryoyu Kobayashi claimed a dramatic victory at the first Four Hills event in Oberstdorf with the competition going down to the wire. The contest was in the balance with Stephan Kraft looking like the first legitimate contender for the crown when he scored 280.5 points in his second run. Then Germany's Markus Eisenbichler took the lead, when a 129m in the second run gave him 281.9 points. However Kobayashi glided to a second run of 126.5, leaving the result unclear to the crowd and competitors while style and wind speed was considered, but a final total of 282.3 gave him victory. Ryoyu Kobayashi flew to 126.5m, to score 282.3. Andreas Stjernen of Norway managed a second jump of 131m, one of the best of the second round, totalling 278.2, ensuring Kraft's podium finish. Dawid Kubacki of Poland nailed his second attempt with 133.5m to reach 269.8. Piotr Zyla reached 126.5m to score 268.3, ahead of Johansson. Daniel Huber flew to 124m in his second effort, behind Kraft and others. Kamil Stoch, the defending champion, added to his first run with 131m for 267.6 to fall behind his countryman Kubacki. Timi Zajc for Slovenia jumped 125.5m to earn 266 points and lose his advantage from the first round, though the teenager remains an impressive performer for the future. Roman Koudelka delivered a huge second round jump of 129m, for 264.4 points, and was leading with 10 jumps to go. Karl Geiger reached 128m for 262.9 points, just behind the watching Koudelka. Stephan Leyhe, another German competitor, flew to 125m to reach 260 points. Yukiya Sato, for Japan, had 255 points to go briefly into the lead after both Freitag and Siegel's ssecond attempts. Simon Ammann, competing for Switzerland, jumped 126m for 258.3. 122.5m earned Richard Freitag 251 points as the final 10 jumps began. David Siegel managed 122m for his second run, and scored him a combined 250.2, falling behind rival German Freitag. Peter Prevc's jump of 122.5 was the furthest of the tournament so far and put him onto 247.5. Killian Peier's second jump secured him a total of 241.2 with a jump of 119m. Evgeniy Klimov sailed with his second attempt to 117m for 240.6, to drop down the leader board. Pius Paschke leapt to 116m for 240.3 points, while Antti Aalto jumped 118m for 240 points. Vladimir Zogravski glided to 239.1 with his second jump. Constantin Schmid jumped 113m on his second attempt, reahing 226.6 points. Johann Andre Forfang could only manage 226.3 points with his two jumps. Jakub Wolny jumped first as the survivor from the second round to reach 117m, to score 225.4 points. Michael Hayboeck secured a second jump of 109m, for 214.6 points in total. Viktor Polasek sailed to 109m to stand at 210.8. Naoki Nakamura reached 108m for a combined points total of 208.8. Markus Scheffner added to his first run with 107m, for 208.4 points combined. The first match up saw Finland's Antti Aalto score 122m in his first jump. Siman Ammann, the Swiss, grabbed 130.1. Naoki Nakamura was first in the second round, grabbed a jump of 118m, against German Sevverin Freund. He needed to beat 121m, but could only manage 118.5m . Anders Fannemel 121.5m, working out at 118.4 points. Karl Geiger scored 129m, a score of 132.1 points. Jakub Wolny disappointed with a jump of 116m, scoring 110.1. Hoffman lept to 114m, that saw him just behind on 109.1. Markus Eisenbichler took the lead when he reached reached 133m, scoring a huge 144.5. His opponent, Jernej Damjan could not match his effort, on 108m only. That gave him a underwhelming 93.5. Stefan Hula jumped 113.5m scoring 107.1, and Michael Hayboeck then managed 118.5 for 114.2. Bor Pavlovcic got 116m, 109.2. Viktor Polasek edged him out with 119m, 114.6 points. Aleksander Zniszczol scored 114.5m for 108.7 points. Evgeniy Klimov reached 124m for 131.4. Martin Hamann notched a 105m effort for 91.1m. Stephan Leyhe hit 125.5m for a huge 131.4. Daniel Andre Tande could only manage 110.5m for 105.5m. Pius Paschke made a jump of 120m for 123.4. Moritz Baer scored 109m for 105.5. Timi Zajc got 127m for 137.1. Manuel Fettner scored 104.5m, earning 92.1. Constantin Schmid was able to get through with 119m, 118.6. Robin Pedersen scraped 117m, for 115.8 points. Robert Johansson grabbed 129m for 139.1. Vladimir Zografski glided to 125m and 125.2, followed by Richard Freitag's 123.5m to finish on 124.1, just behind. Philipp Aschenwald got to 122.5m for 114.2, and his opponent Yukiya Sato hit 130m for 126.2. Markus Schiffner managed 119.5m, for 112.1. Andreas Wellinger tumbled after a landing, but could only reach 114.5m before that, for 109.6 to fall short. Lukas Hlava flew to 109m, grabbing just 93.6. Dawid Kubacki 128.5m for 132.3 to get through with one of the best scores of the tournament so far. 123m for Killian Peier for 120.9 points. Kamil Stoch got 127m for 134.7 in an impressive jump. Junshiro Kobayashi reached 101m, for 87.7m. David Siegel of Germany grabbed 121.5m to earn 125.8. Anze Semenic, for Slovenia, reached 117.5m to earn 114.1. Roman Koudelka of the Czech Republic then scored 128.6 with 126m. Peter Prevc reached 120.5m for 121.2, and his opponent Daniel Huber jumped 129m for 138.4. Daiki Ito grabbed 123 for 120.7, and his rival Andreas Sterjnen reached 132.5m and 140.6. Johann Andre Forfang reached 125m for 125.2 points, and Piotr Zyla, the third favourite, sailed to 133m and 139.3. 124.5m earned Canadian jumper Mackenzie Boyd-Clowes 120.7 , and Ryoyu Kobayashi found 138.5m for 147.2, to give him the lead. Jonathan Learoyd jumped to 119.5m for 111.7, and Stefan Kraft reached 131m for 134.8.